Muslims From All Over The World Are Mourning Tableeghi Jamaat Emir Haji Abdul Wahab's Demise! 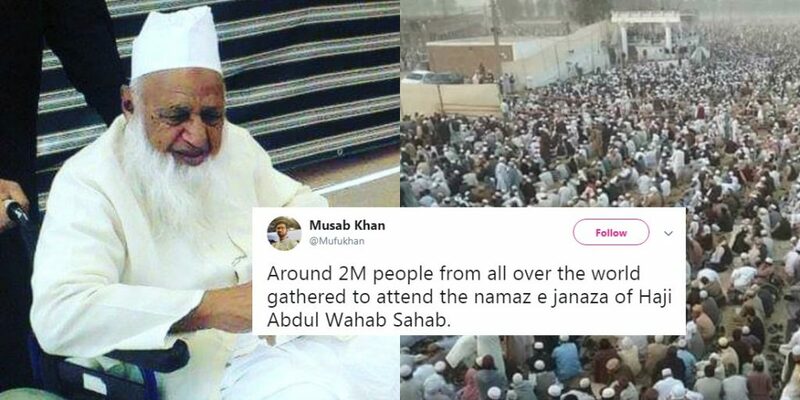 Muslims From All Over The World Are Mourning Tableeghi Jamaat Emir Haji Abdul Wahab’s Demise! When the Prophet Muhammad (PBUH) delivered his Last Sermon to the Muslim Ummah before he passed away, he informed them that he had concluded the religion of Islam on them. Everything he had taught them, was now to be followed, a clear path, given for the betterment of mankind. Since then, Muslims from all over the globe have worked earnestly and devoted their lives to the spread of Islam, its message and the perks that come with being a part of the religion. In Pakistan, the characteristics of Tableegh are a huge part of a Muslim’s life, where he devotes everything he has to spread the message of Islam, by the will of Allah and the Prophet (PBUH)’s Sunnah. One man, who gave all his life to the said cause, was the Emir of Tableeghi Jamaat, Haji Abdul Wahab. The Emir, recently, passed away at the age of 95 years, after he selflessly presented his whole life to the cause of Islam. 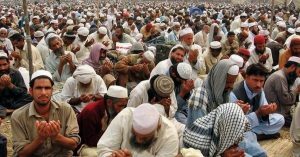 The cleric’s funeral prayer was offered at Raiwind Ijtema Haveli after Maghrib prayer after which he was laid to rest in a graveyard adjacent to the TJ centre in Raiwind. Since the news came out, condolences from all over the world have been pouring in. In the funeral prayer of Haji Abdul Wahab, thousands of people showed up in Raiwand, showing their love and affection for the Emir, who was thought of being an earnest, hardworking, diligent and honest stakeholder of the religion in the country. Prime Minister Imran Khan highlighted the Emir’s services for the Muslim Ummah and presented his condolences as well, expressing his grief and sorrow. “Haji Abdul Wahab’s contribution to religious affairs will always be remembered,” said the Minister of Religious Affairs and Interfaith Harmony, Noorul Haq Qadri. Haji Abdul Wahab started spreading the message of Islam in 1944, as an inspired student of Maulana Ilyas Kandhawi. 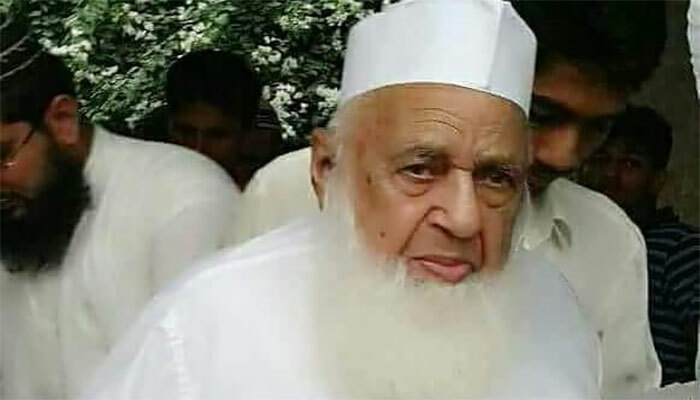 After migrating to Pakistan in 1947, he set up the Arabic Madrassah in Raiwand, leaving his job later to spread the message of Islam in the new found country. In 1992, Haji Abdul Wahab became the Emir of the Tableeghi Jamaat and since then, he remained the highest authority of the Shurahs based in New Delhi. The Ummah has been mourning his demise as a great loss. People like Maulana Tariq Jameel and late Junaid Jamshed have served as his students. The general perception now is that nobody will be selfless enough to succeed Haji Abdul Wahab as the Emir of the Tableeghi Jamaat, a faction of religion that still believes in the authenticity of the religion and not extremism. This Pakistani Guy Made Shehbaz Sharif Look Like A ‘Chor’ In Front Of Marks & Spencer And It’s Kinda Unethical! Designer Christian Louboutin Takes ‘Peshawari’ Chappal Global And Pakistanis Should Be Extremely Proud! Visually-Impaired Civil Judge Yousaf Saleem Breaks Record For Settling 20 Cases In Three Months! Omar Ayub Trolls Bilawal Bhutto Stating ZAB Called Ayub Khan His ‘Daddy’ And What Is This Siyasat! Cricketer Asif Ali Just Announced His Daughter Is Fighting Stage IV Cancer And She Needs Your Prayers! Truth Behind ‘Polio Issue’ Viral Video In Peshawar Has Been Exposed And Taubha, Yeh Kya Harkat Hai!